Home » More Men Opting to Address Double Chin with the Injectable Treatment Kybella! More Men Opting to Address Double Chin with the Injectable Treatment Kybella! Men who are unhappy about the looks of their double chins might have been reluctant to have neck lift surgery, but now that there’s a minimally-invasive option for restoring a more chiseled, youthful look to their necklines, men are in line. In fact, an article appearing on Fox News reports that cosmetic surgery experts are seeing more men between ages of 30 and 70 years wanting the double-chin-reducing option, Kybella. 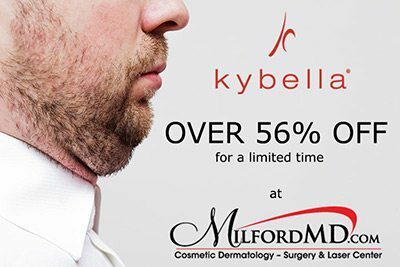 For a limited time, MilfordMD Surgery & Laser Center is offering a discount over 56% for Kybella treatments. Kybella is a non-invasive, FDA-approved treatment that helps eliminate fat under the chin. 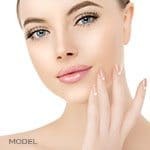 The U.S. Food and Drug Administration (FDA) approved Kybella in April 2015 to treat adults with moderate-to-severe fat below the chin, known as submental fat. At this point, it’s not approved or recommended for areas other than the chin, according to the FDA. Kybella is injected deoxycholic acid, which is identical to the deoxycholic acid produced by the body. Deoxycholic acid naturally is a fat absorber. The drug, a cytolytic drug, which is injected to the double chin goes into the tissue and destroys the cell membrane. “In the right hands, Kybella injections into the submental fat destroys only the targeted fat cells,” Dr. Buckley says. “Male and female patients should go to experienced cosmetic physicians for the procedure, because, in the wrong hands and injected incorrectly, the medication can destroy skin and other types of cells.” Dr. Buckley administers Kybella by injecting the submental fat tissue up to 50 times, depending on the amount of fat. And patients may need up to six treatments, performed a month or more apart. 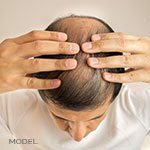 But some, according to Dr. Buckley, may require fewer injections and treatments to achieve desired results. As an introductory offer, for the month of January 2017 MilfordMD is discounting the price of Kybella (per vial) by over 56%. Also for the month of January, the public can enjoy complimentary consultations, which are meant to encourage men and women to learn whether they are good candidates for a Kybella treatment or discover options for other aesthetic concerns.